Investors love a good dividend, but here are some dividend payers you should stay away from. In volatile market like today's, Dividend Aristocrats can offer some of the best investments available. These stocks have raised their dividends every year for 25 years straight, showing steadily growing profits, above-average returns, and the ability withstand challenges including recessions and new competitors. Dividend Aristocrats have a track record of outperforming the market, and with lower volatility. However, not all of these stocks are created equal. Permanent membership is no guarantee as the financial crisis forced a number of stocks of the list, and many titans eventually see their empires crumble. Just look at staples of yesteryear such as Eastman Kodak and Woolworth's. Sean Williams: A Dividend Aristocrat I wouldn't touch? How about paints and coating specialist Sherwin-Williams (NYSE:SHW). On the surface I have to give Sherwin-Williams a lot of credit. Its partnership with Lowe's (NYSE:LOW) has allowed it to grow hand-in-hand with the do-it-yourself retailing giant. Sherwin-Williams has also benefited from historically low lending rates, which have allowed consumers and commercial businesses access to cheap capital and the ability to buy, remodel, or build homes. Finally, Sherwin-Williams has enjoyed a recent decline in raw material costs vis-à-vis falling commodity prices. That's the good. Now, here are the two reasons why I'd rather not have any part of Sherwin-Williams. First, Sherwin-Williams' business is intricately tied to the health of the U.S. and global economy, and Q4 GDP figures in the U.S. weren't pretty at just 0.7% growth. Furthermore, China's full-year growth was its slowest in 25 years. Although Sherwin-Williams is benefiting from lower commodity costs, falling commodity prices are a possible signal that global industrial demand could be sinking. That's bad news for Sherwin-Williams' overseas operations. The other issue I have with Sherwin-Williams is its dividend. Even with its 22% dividend increase in 2015, it's currently yielding just a hair over 1%. You could buy an index fund and double your yield! Despite its 37-year streak of raising its annual payout, Sherwin-Williams' dividend hasn't seen a commensurate rise as its stock price has risen, leaving income investors holding onto false hope. Making matters worse, Sherwin-Williams' fiscal 2016 EPS forecast of $12.20-$12.40 fell short of Wall Street's estimates, and its expectation for a low single-digit percentage increase in sales doesn't exactly pass muster in my book with a P/E of more than 20. If I were you, I'd consider looking elsewhere. Keith Noonan: Foods maker Sysco (NYSE:SYY) has raised its payout for 45 years running and currently offers a 3.15% yield, but its approximately 64% payout ratio looks prohibitive to meaningful increases in light of the company's growth outlook. In fact, Sysco's dividend increases are already on a disappointing trend, with a cumulative payout bump of just 19% in the last five years, and a lack of clarity as to how the company can support significant dividend growth down the line. The company's annual free cash flow grew just around 1% across the last two yearly reporting periods, it doesn't look like the FCF situation will improve dramatically in the mid-term future.. While revenues have increased roughly 24% in the last five years, Sysco's annual earnings have dipped approximately 41%, and a forward P/E ratio of roughly 22 puts the stock out of the range of being a value play. On paper, Sysco has an impressive dividend history and an attractive yield, but a closer look suggests that value investors can find better picks on the list of dividend aristocrats. Tamara Walsh: As investors, it is easy to assume that all dividend aristocrat stocks are created equal and will continue to reward shareholders for years on end. These are companies, after all, that have not only paid but also increased their dividends annually for at least 25 consecutive years. However, I wouldn't buy Hormel Foods (NYSE:HRL) stock today despite its reputation as a dividend aristocrat. For starters, Hormel lacks the global branding fame of other Dividend Aristocrats, including PepsiCo and Coca-Cola. This means less pricing power, which could dilute margins down the road. A consumer shift toward healthier eating and away from processed foods could also hurt the company going forward. The majority of Hormel's brands consist of processed meats including Spam, its namesake brand pepperoni, deli meats, and bacon. Hormel is also vulnerable to animal diseases since its products rely on livestock. For example, the stock took a hit last month after a commercial turkey flock was found to have avian influenza. Hormel's livestock operations were not involved in the outbreak, but that didn't stop investors from running for the exits. Finally, there is the stock's pricey valuation compared to other dividend aristocrats to consider -- particularly given the volatile start to 2016 in the public market. Hormel Foods is up more than 47% in the past year and currently trades around $78 a share or near the high end of the stock's 52-week range.Additionally, Hormel trades at more than 30 times earnings today thereby giving the stock one of the highest price-to-earnings ratios in the industry. On top of this, there are plenty of other reliable dividend payers within the aristocrats index that boast much richer dividend yields than Hormel Foods, whose yield currently resides at just 1.48%. For these reasons, I believe there are more rewarding income stocks than Hormel Foods available to investors today among the Dividend Aristocrats. Demitri Kalogeropoulos: The dividend at Lowe's (NYSE:LOW) has risen every year since it went public in 1961, which says a lot considering that it had front row seats to the housing market collapse a few years ago. 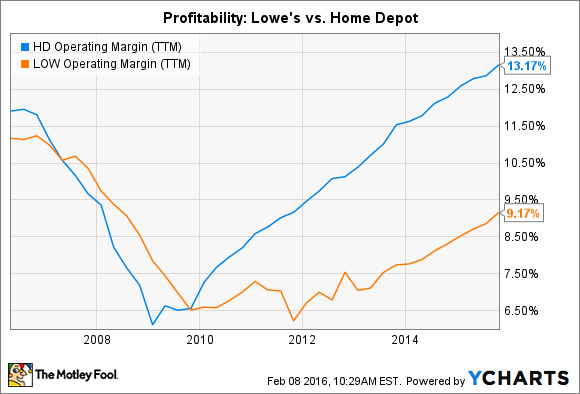 That industry slump forced rival Home Depot (NYSE:HD) to pause its payout hikes for three straight years while Lowe's dividend kept marching higher. But I'd still buy Home Depot over Lowe's right now. For one, Lowe's can't seem to win the market share race. Customer traffic gains powered better comps for Home Depot (7%) than for Lowe's (5%) in the latest quarter. Zoom out and you'll see that trend persisting: Lowe's comps were also 2 percentage points lower than Home Depot's for fiscal 2014. And third, Lowe's dividend commitment just isn't as strong. CEO Robert Niblock and his executive team target a 35% payout ratio, compared to Home Depot's 50% goal. That conservative approach obviously helped the company navigate the worst of the housing market crisis without requiring a payout cut, but it also leaves shareholders with a lower current yield and weaker growth prospects. It's impressive that Lowe's payout could withstand a once-in-a-generation market collapse, but it's still the weaker dividend stock in this industry. Jeremy Bowman: Wal-Mart Stores (NYSE: WMT) has ruled retail for nearly two generations. The big-box chain is far and a way the world's biggest retailer, but its kingdom is threatened. Every year, it loses share to major rivals like Amazon.com and Costco Wholesale, both of whom have become $100-billion retailers by undermining its business model. For years, Wal-Mart grew rapaciously as consumers counted on it for low prices and a wide selection, but Amazon taken that formula, applying it to e-commerce and finding unstoppable growth in the process. Its North American retail sales grew 24% in the most recent quarter while Wal-Mart likely saw U.S. sales growth of just low-to-mid single digits over the holiday period. Over the coming years, the pressure from Amazon should only intensify. More importantly, Wal-Mart's need to stay competitive is eating into its margins. The company is hiking its minimum wage to $10 an hour this month to improve its stores and customer service, but the move will cost it $1.5 billion this year. As a result, its EPS is expected to fall from $4.53 to $4.17. Its dividend payout ratio is low and its dividend solid at a 3% yield, but competitive pressure will continue to build and could crunch the stock further.